Popcorn is the perfect movie night snack, my family loves popcorn and it’s one of my and my husbands favorite snacks to enjoy with wine while watching a movie. Popcorn and wine are one of our guilty pleasures if you would call it that. 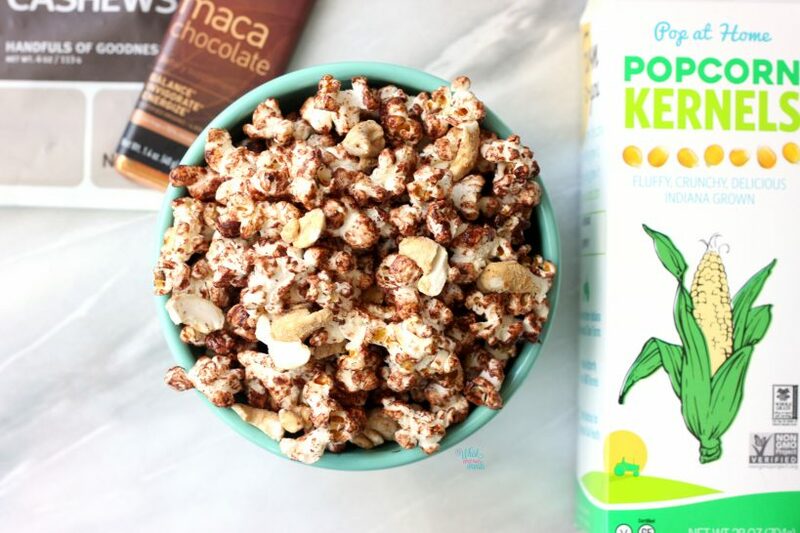 I decided to up our popcorn game by adding two of my favorite maca snacks! Maca Chocolate and Maca Maple Cashews! Who doesn’t like chocolate and the cashews add a hint of butterscotch like flavor and extra crunch! This popcorn is far from sweet as the Maca Chocolate is a darker chocolate and not a sugary sweet chocolate bar. I could eat a Vega Chocolate Maca Bar and bag of Navitas Naturals Maca Maple Cashews in one day/sitting they are so good. I use to have to limit myself as the cashews weren’t available locally so when I ran out I would have to wait to order and wouldn’t order until I had a big enough order or needed other things from Vitacost. Well what do you know my Whole Foods finally started carrying them a few months ago so I can grab a bag whenever I want! Haha. As far as the chocolate bar well I’m a dark chocolate fan and I love this bar because I can break a piece off and it satisfies me. If you haven’t heard why I love maca so much or don’t know what it is. Maca is a super-root from Peru that has been traditionally used as a stress-fighting adaptogen, and to increase stamina, boost libido and combat fatigue. I first started using maca for fertility reasons and later feel in love with it for it’s endurance and energy support, support healthy adrenal function (prevent adrenal fatigue from working out), and of course healthy hormone balance. I personally like the flavor and think it has a slight butterscotch/caramel flavor, my husband well he will probably tell you it tastes like corn as he that’s what he thinks of when I pull out the gelatinized maca powder. It is a superfood and I thought it would be perfect in this “date night” popcorn as it boosts libido, it’s used to support energy and endurance, and promote healthy hormone balance. Not to mention chocolate and the crunchy cashews it’s delicious! Pop kernels using preferred method (stove top, air pop, etc), when cooking on the stove I use coconut oil. 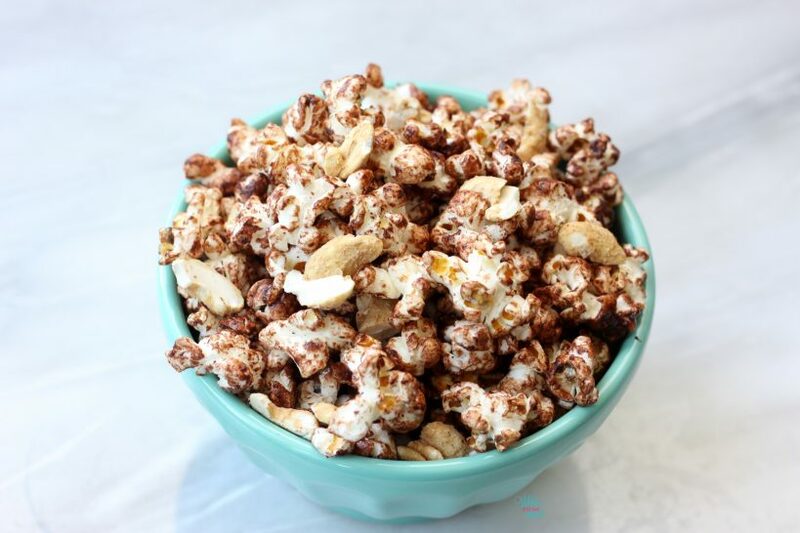 In a large bowl toss together chopped chocolate and warm popcorn. Sprinkle with Maca Maple Cashews. Grab a good movie and enjoy! 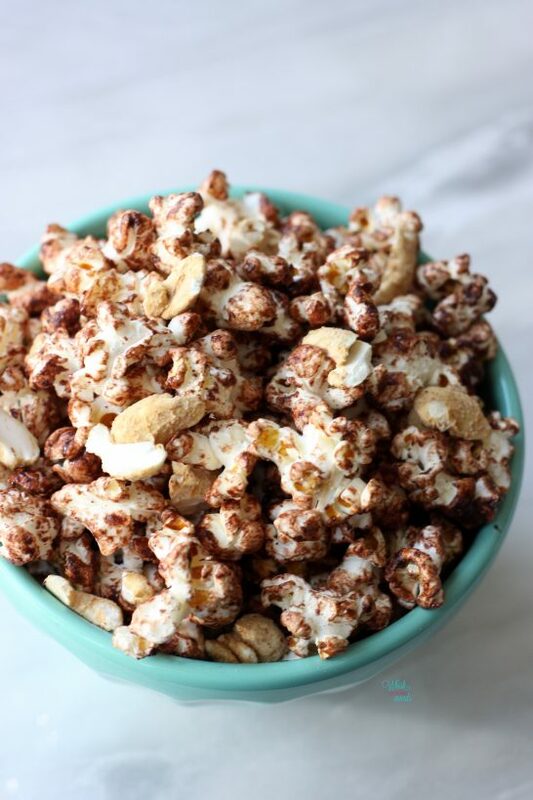 Popcorn, chocolate, cashews, with a superfood boost! 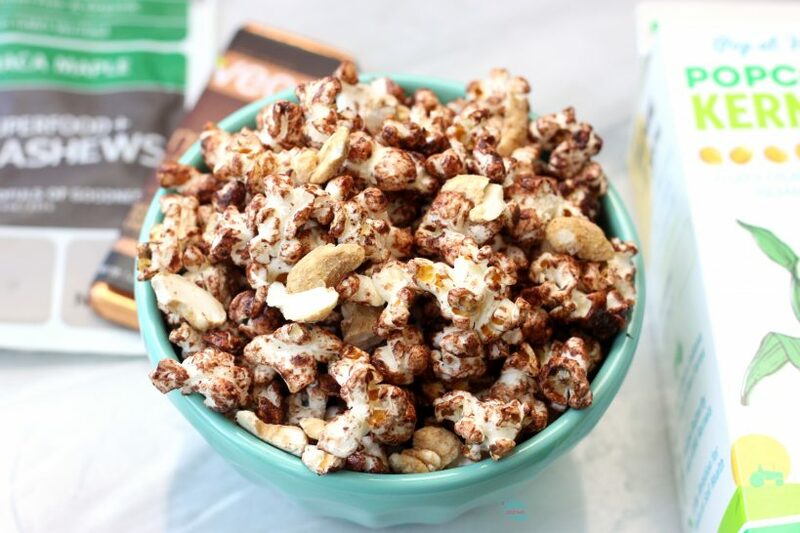 Quick and easy this vegan and gluten free snack will get your next movie night poppin! Happy Friday! Since it’s Friday I’m also linking up for Foodie Friday with Annmarie, Farrah, Esther, + Jess. As well as Vegan Friday with Mary Ellen and Kimmy! Check them out for more recipe inspiration! It’s on sale this week at Target! It’s so good! Right there with you! If you haven’t tried those Maca Chocolate Bars or the Maca Maple Cashews you have to, they are my favs! O the fanciest popcorn snacking I’ve seen! Oh no… well maybe but the White Truffle Oil and Dark Chocolate Balsamic Vinegar I had the other day was up there! So do I, it’s fun! Thank you, it’s really not that bad at all. Great idea!! I munch on the maca bars, but I guess this would be a more creative way to enjoy them. I love it!! Popcorn is one of my favorite snacks ever! Love that you added cashews AND chocolate!!!! Chocolate and popcorn?? YES! One of my favorite combination. Love the addition of the cashews too. This looks like the most delicious way to jazz up traditional popcorn!! I can’t wait to try this for our next movie night! This popcorn looks so tasty! I love the idea of using the maca chocolate powder. I used to have some but ran out so I need more! Adding the cashews in makes it look all the more delicious! AMAZING! My 3 year old has recently gotten really into snacking on popcorn when we’re at home watching movies. And of course she’s been a chocolate lover since the day she first tasted it. She would be jumping up and down with glee if I brought out a big bowl of this deliciousness! What a great recipe idea! Thanks for the inspiration! I just recently discovered how delicious chocolatey popcorn is and I am totally hooked now. Love that you used the Vega Maca chocolate here – it’s so good! Can’t wait to try this during my next movie night!